Genius Scan is telling me my email isn't configured, but it is! How do I fix that? Please open it, and try to send an email to yourself from there. It means that your phone was configured by your company and has a restriction preventing other apps such as Genius Scan from sending emails. To disable this restriction, ask your IT department to disable the "PreventAppSheet" setting on the mail account configuration (you can even give them this link). Configure an email account in the Settings app. Please refer to Apple's tutorial for a walk-through. If you still cannot use the Mail app, you can try using other mailing apps that are installed on your device, such as the Gmail app, Yahoo Mail or Outlook. 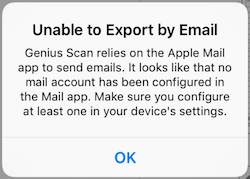 Check out this help article about exporting scans to other apps. My emails won't send – how can I fix that?